The montage at the start of this flick gives you a rough sketch of what you are getting yourself into. 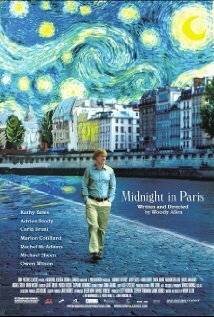 The movie starts with a montage of various locales of Paris with a jazz saxophone cover. That’s when you realize that this here’s not an “action” venture, and if you were planning for one, now’s the time to change the DVD. Because as the movie progresses, one kinda gets lazed into the whole scheme of things. Either it’s the story or the picturesque city with all its lights or just the slew of beautiful faces that gets you glued till the credits starts rolling. [two_columns_one]The movie starts with Gil (Owen Wilson) and Inez (Rachel McAdams) in Paris. Gil is a screen-writer who dreams of making it BIG one day. They are in “love” and on their way to getting married. Gil is a sweet guy (the kinda roles Owen always plays), while Inez is the harsher of the two. And she, along with her parents, is very little appreciative of the soft-spoken and mild-mannered Gil. Inez, like her parents, plans on settling in the US after their marriage, while Gil has his dream of being in Paris where his literary idols were once in their prime, and loves his long solitary walks in the rain. Then one night, during such a walk, at the stroke of midnight, magic happens. He gets into a cab and gets transported into a world where he walks on the same ground as his Idols (Hemingway, Fitzerald and the like) and breathes the same air and on more than one occasion shares the same decanter of wine. Now the magician of a Director that Woody Allen is, we are not left wondering how he time-travels from one era to the next, nor is an explanation given or is necessary. We go on with the flow, with the fantasy of the master. Characters from the pages of history are thrown in and out at His whim, and we are happy to see them talk with the main character and give their opinions on things, flawed though they maybe at times. [two_columns_one_last]At the very core of this kind-hearted flick is Owen Wilson, who with his ever endearing, mild-mannered, hero-worshipping Gil, gets the movie sailing along with determination. And also with stellar acting from Marion Cotillard, Kathy Bates and the rest of the cast and a Master at the helm as the Director who never loses his way along with this Fantastic, implausible script makes this flick this humble writer has had the pleasure of multiple viewing, just plain magical. Now, many of the characters in the film are unfamiliar to us, but they don’t need to be (we know they must be of some renown). It is my opinion, the sole opinion of this ‘ngari’-fuddled brain of mine, that movies serve the purpose of transporting us to enchanted places where we’ve never been, to help us relive the experience of the places we’d been to and to, strangely, re-familiar ‘ise’ ourselves with all the feelings and emotions – old and new. And “Midnight in Paris” does just that to the viewer.